Eiffel Tower is situated in the heart of beautiful city Paris. Eiffel Tower was named after the engineer Gustave Eiffel. Gustave’s Company designed and built this tower in the year 1887-89. This Tower is about 324 metres or 1,063 Feet’s tall. According to the source, in the year 2015, it breaks the record of most visited place in the world with almost 6.91 Million publics. Every year people around 7 million visit this tower, among them 75% are from foreign countries. This place is best to visit with your family and the perfect place for couples. Colosseum is also known as the “Flavian Amphitheatre. This place is in centre of the capital city Rome, Italy. Colosseum was built in early days of Emperor Vespasian in AD 72 and this place was completed under Vespasian’s successor and heir Titus in AD 80. This place is a most popular destination for botanists or researcher’s as Colosseum is a historical place in Rome. Colosseum is famous destination among people those who love to visit historical place in Europe. Reini is a countryside of Moskenes in Norway. Reini is a popular place for fishing. Lofoten Island is a destination mostly known for Natural Scenery with Mountains, Hills, seas, beaches and tall peaks. This place is located about 300 kilometres far from the southwest town of Tromso. Lofoten is a place for a natural attraction like northern lights and the midnight sun. 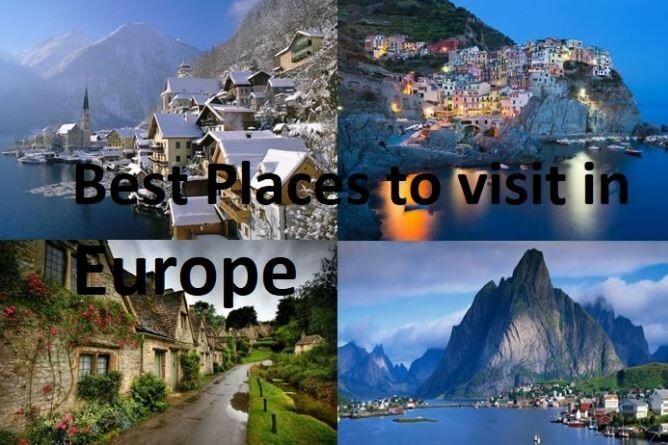 People those who love natural beauties then this destination is the perfect place to visit in Europe. Amsterdam is the capital of the Netherlands and most watery city, Canals in Amsterdam has more than 100 Kilometres, almost 90 islands and 1,500 bridges. Alongside with monumental buildings, there are almost 1,550 canals. There is three main canals name as Keizersgracht, Herengracht and Prinsengracht. This canal was made in the 17th century during the era of “Dutch Golden Age”. Canals like Herengracht, Jordaan, Keizersgracht, and Prinsengracht, these canals were placed on the “UNESCO World Heritage” list in the year 2010. Fort Lovrijenac is located outside the wall of the city of Dubrovnik, Croatia. It is about 37 metres or 121 feet above sea level. This place is also known as “Dubrovnik’s Gibraltar”. Fort Lovrijenac has a three-sided shape with three terraces, defended with big 10 cannons from three-sides. Built with 37 meter high. Lovrijenac is one of the top destination in Dubrovnik, Croatia. Plaza Mayor Square has located in the heart of capital city Madrid. It was built during Philip III’s in the year 1598-1621. This place is located only a few steps away from another famous plaza, Puerta Del Sol. Plaza Mayor’s Shape is rectangular, measurement of Plaza Mayor is 129*94 meters or 423 *308 feet and it is surrounded by three-story residential buildings with 237 balconies and it has exactly nine entrance ways. Plaza Mayor is mostly visited by local tourists but this place is also the perfect place to visit for foreign people. Basel city is located in northern side of Switzerland on the beautiful river Rhine. Basel is Switzerland’s third largest city after Zurich and Geneva. This city is especially famous for museums and rivers. Rhine River is a beautiful river in Europe which started in the Swiss “Canton of Graubünden” in the southeast part of Swiss Alps. In 1990’s, this river was used for dumping whereas it was polluted with industrial chemicals but now it has been a destination for people from Europe as well as International tourists. Berlin is the capital city of Germany with a population 3.7 million approx. Grunewald is a forest in Germany which is located in the western part of Berlin and eastern part of the Havel. Grunewald Forest was the place much loved by Berliners who wanted to emission the hustle & bustle of their city life. Those who love peace and quiet area this destination is best one for relaxing and peace of mind from outside of the urban city in the Germany. Prague is the capital city of Czech Republic and it’s the largest city. This city is situated on the northwest side of the country on the Vltava river with more the 1.4 million people. Old Town Bridge is a remarkable Gothic structure with defending one end of Charles Bridge and indicating the entrance to the Old town. This Tower was built in the year 1380(late 14th Century) on the orders of Emperor Charles IV. Old Town Bridge tower is one the historical place to visit in Europe. The United Kingdom is surrounded by the Atlantic Ocean and it is consists of four different countries Scotland, Wales, England and Northern Ireland. Cornwall is a countryside of England, it is dividend with north and west of the Celtic Sea. Cornwall is a place where land meets the sea and with secret valleys, high sided lanes, beaches, seaside villages and wild moorland. There are few top sights in Cornwall like Eden Project, Tresco Abbey Garden, Kynance Cove, St. Michael’s Mount and much more. This place has been holiday destinations for local people as well as international foreigners. St Ives and Padstow are the popular places to stay in Cornwall.